Eurasian Tree Sparrows are, as their name implies, native to temperate areas of Europe and Asia, all the way into Southeast Asia. They also have an established population in and around St. Louis, Missouri—that population reportedly began with 12 birds imported from Germany in April 1870 to be released in one of the old “naturalization” projects that introduced popular birds from all over the globe to new countries. That small population hasn’t spread much, even as starlings introduced in New York City were spreading all over the continent. 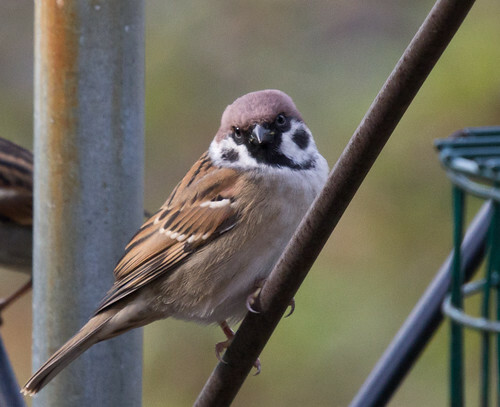 Eurasian Tree Sparrows are considered a pest species in Australia—they aren’t introduced intentionally there, but sometimes start nesting on ships in various ports in Southeast Asia and stay with the ship all the way to Australia.